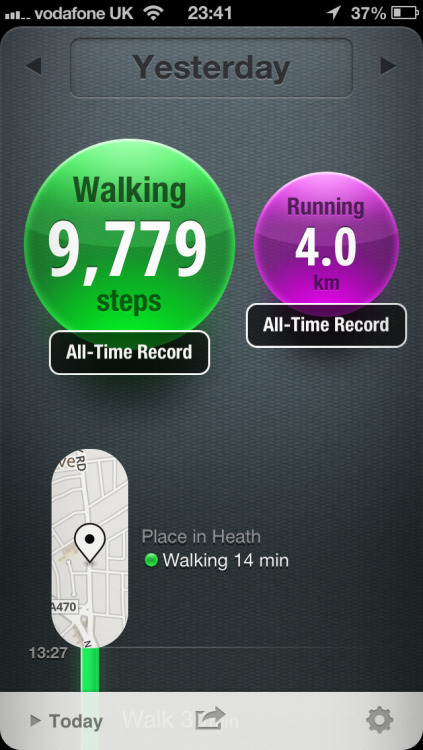 If you're interested in tracking the steps you take each day, whether walking, jogging, running, or how far you cycle - then 'Moves' on iPhone is what you need to go download right now! It's simple to use: download, open, allow it to track your location, and let it run in the background. Just check back whenever you'd like to review your progress that day as well as any previous day. The interface couldn't be simpler! Just remember that the app can only count your movements when the phone is in your pocket! As great as your iPhone is, it won't know you've just done a 10k run if its at home on the coffee table. Picture attached showing my movements from Sat 9th Feb 2013!